Barrel Stave Wall Rack Authentic barrel staves reclaimed and fitted with recycled iron to cradle up to 9 of your favorite bottles. With the rustic appeal of one discovered at a Sonoma flea market, this vintage piece brings home all the warmth of wine country living. 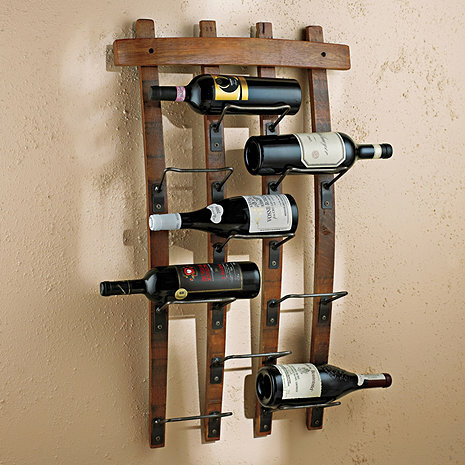 Barrel Stave Wall Rack Authentic barrel staves reclaimed and fitted with recycled iron to cradle up to 9 of your favorite bottles. With the rustic appeal of one discovered at a Sonoma flea market, this vintage piece brings home all the warmth of wine country living. Allow 3 to 4 weeks for delivery. 2 Each piece is made by hand. I am in need of just the wine bottle holders. Can I buy those separate? This IS curved, right? I need a curved wine rack--to go around a little curve I have in my brick chimney, so I want to make sure I'm buying a curved rack. If, in fact, it IS curved...is there a way to measure the curve? BEST ANSWER: Yes it is curved tapering from top to bottom, with the middle having the greatest depth from the wall (maybe 2-3 inches). It is a very nice piece-- I have it at my place on the North Fork of LI (wine country). the wall to center of curve, it measures 2 1/8 inches. So that's how far it sticks out from wall at most curved spot. Hope that helps! The Barrel Stave Wall Rack is curved. The curve is approximately three to four inches deep. Each rack is unique, so the depth will vary slightly. Yes it is curved. Think about how a wine cask/barrel looks - the rack is made from the barrel staves of a actual wine cask. I love mine!! It is curved bother vertically and horizontally. Do you have a holder for the larger wine bottles? BEST ANSWER: We have two barrel stave wine racks which accommodate larger bottles. One is item number 570 08 11 and the other is item number 570 08 10. The rows that have a single holder will accommodate a 1.5L magnum. Also want to add, this was a gift to my daughter and she loves it! She gets a lot of compliments. Can anyone tell me approximately what the width dimension is with wine bottles in place? BEST ANSWER: Mine varies from 25-26 inches. It can be slightly less or maybe a little more depending on how close you place the bottles together/apart. The width will vary depending on the bottle formats anywhere between 25" -28"
Mine is about 26-27 inches with the wine bottles on it. I measured 26" with the bottles. Does it come with mounting hardware? Does it need to be mounted on studs? BEST ANSWER: The rack came equipped with hangers on the rack itself but you will need to purchase and install the wall side mounts separately. You do not need to tie into wall studs, however I would recommend penatrating the sheet rock with a 'toggle' style hanger. With wine bottles on it, it should be securely mounted on studs. There are hanging clips on the rack itself, but no wall fasteners come with it. It does not come with mounting hardware. You can use studs. I purchased the heavy dry wall anchors and they have held up well. BEST ANSWER: The Barrel Stave Wall Rack is made from authentic barrel staves and are finished with a custom pine colored stain. I think you'll have to wait till you get the rack and then have the stain matched at the paint store. The rack is on my wall. I was hoping for a response by the company that makes the product. It is a pretty brown and goes nicely with nearby cherry cabinets. I was looking for an exact stain color. Thanks. Love the look and the design. It will be perfect on the wall once I figure out a better, more secure way to hang it rather than on the flimsy metal rings that it came with. The delivery took longer to arrive than stated, about 6 weeks. Looks great in my kithchen! Rustic and practical. Holds bottles so you can see the lables. We have had this wine rack about nine months. We love it! I love it! We have a small built in bar and it fits perfectly! Great functional and decorative piece! I love the function and unique look of it. It looks great in my dining room! I've only had it a few days, and already received many compliments. Authentic barrel slats as depicted. Very pleased with how it looks and with the quality of construction. The antique finished hardware, (bottle racks) are heavyduty and solid but not disproportionately overbearing - just right. The piece I received looks exactly like the picture. If you like what you see, that's what you will get. Shipping time was quicker than expected and the item was safely packet. HIGHLY RECOMMEND this item and the Merchant behind it. Love the wine rack. Very sturdy and I get compliments all the time. High recommend it. Love it and looking forward to making it the "feature" on one of the walls in our new wine cellar. Great custom, heavy duty product. One of a kind. Love it! Looks great! It’s a perfect fit. It’s raw, basic and functional. It says more about the wine than the owner. I gave this to my husband for Christmas! He said it was his favorite gift ...ever! It was easy to hang and looks great in our newly redecorated dining room. Love it. We saw it at a local winery and tracked it down. Great look, good quality. Attachment hardware could be improved but is adequate. Excellent appearance and quality, with many compliments!! Very good addition to our wine cellar. Very sturdy, true to the stated dimensions. Would recommend it to others. Purchased two of the barrel wine racks. They look fantastic on our wall, great addition and really makes a statement.